The Irish Hunger Memorial winds through a rural Irish landscape, with paths carved into a hill thickly lined with native Irish plants and stones imported from each of Ireland’s 32 counties. The Irish Hunger Memorial, designed by internationally renowned sculptor and public artist Brian Tolle, originally opened in 2002 to honor the Great Irish Hunger and Migration of 1845-1852 while encouraging viewers to contemplate present-day hunger worldwide. Through the years, however, it had succumbed to water infiltration from above and subsequent water damage. 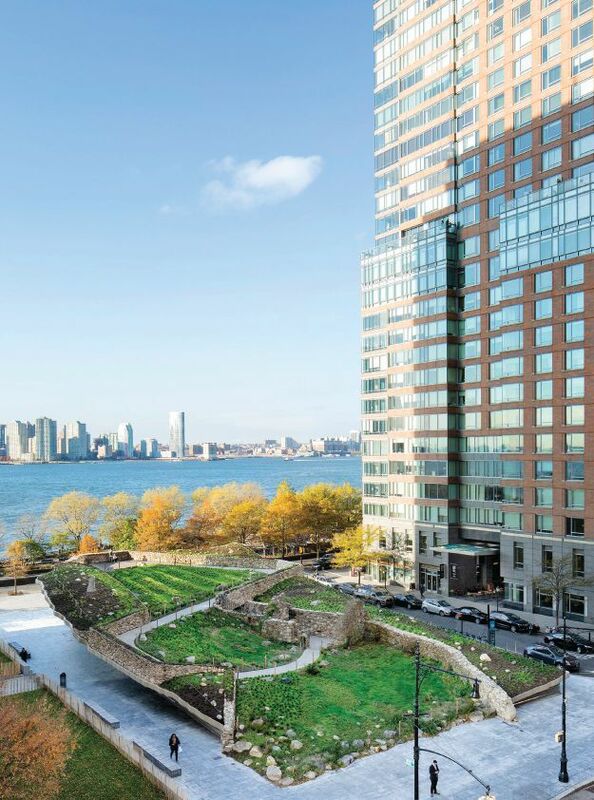 Fortunately, Battery Park City Authority (BPCA), CTA Architects, P.C., construction manager The LiRo Group, and contractor Nicholson & Galloway Inc. recently completed a $5.3 million renovation and waterproofing of the Irish Hunger Memorial. The project restored the monument to its former magnificence, while rendering it significantly less susceptible to damage from weather for years to come. Contractor: Nicholson & Galloway Inc. Mechanical, Electrical and Plumbing (M/E/P) Engineer: Collado Engineering P.C. The half-acre site on the corner of Vesey St. and North End Ave., in the Battery Park City section of downtown Manhattan, overlooks the Hudson River. Visitors to the 96- by 170-foot Memorial wind through a rural Irish landscape with paths carved into a hill thickly lined with native Irish plants and stones imported from each of Ireland’s 32 counties. The paths lead to a breathtaking viewing point 25 feet above street level that boasts views of the Statue of Liberty and Ellis Island. Located centrally along the pathways is an authentic Irish Famine-era stone cottage that was donated to the memorial by Tolle’s extended family, the Slacks of Attymass, County Mayo. It was disassembled and brought over from Ireland and reconstructed onsite, within the green “hillside” of the memorial. The cottage, pathways and plant-filled meadows are cantilevered over a layered base of glass and polished fossil-bed limestone from County Kilkenny, Ireland. Shadowy text that relates to the Great Irish Hunger and reports of contemporary famine form upon the frosted glass panels, wrapping around the exterior of the Memorial and into the passageway leading to the cottage. Similarly, CTA’s project manager for the Memorial, Frank Scanlon, AIA, grew up in County Roscommon and County Mayo. “We were thrilled to be able to provide a solution to keep the memorial open year-round for years to come,” he says. 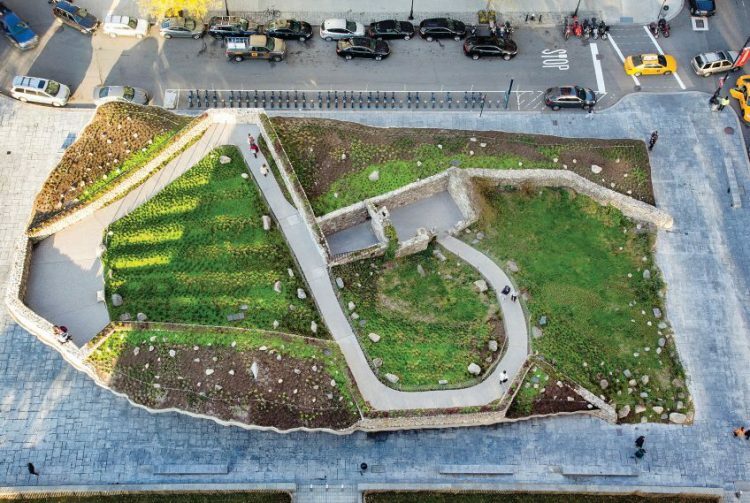 The main challenge of the Irish Hunger Memorial renovation was making the meadow function as a live elevated field with naturally growing plants and its own living ecosystem, despite the planted area being located on top of a waterproof concrete slab. The 7,200-square-foot planted area features 90,000 plugs of grasses and 52 different types of plants native to Ireland. Soon after the memorial was first opened to the public, BPCA noticed cracking and a leak from the cantilevered slab where the monument’s landscaping and cottage were located. GACE, the project’s structural engineering firm, evaluated the concrete structure and determined that leaks were caused by underperforming waterproofing rather than any structural issues; there were no structural problems within the memorial. The cottage, pathways and plant-filled meadows are situated on a concrete slab cantilevered over a layered base of glass ribbons and polished fossil-bed limestone from County Kilkenny, Ireland. Upon inspection, it was found that leaks were going into the electrical space underneath the memorial, where the glass display panels and lights were installed. A remediation project that waterproofed a portion of the memorial the following year failed to stem the seepage. The leaks led to efflorescence staining of the glass display panels as well as discoloration of the partially cantilevered slab and a skirt underneath it. Some of the limestone base cladding panels also had been stained. BPCA subsequently hired CTA, which recommended a comprehensive technical solution that would address the leaks and render the memorial impervious to weather for many years to come. “Our team recommended carefully removing the landscaping surrounding the field-stone masonry walls and portions of the cottage, removing the previously applied and ineffective waterproofing system, performing limited slab repairs and patching, reconfiguration of and reinforcement of the concealed core walls and substrates, and then installing a waterproofing membrane, and then assembling the elements of the monument back together,” explains Scanlon. Work began in August 2016, with Tolle approving all finishes and technical solutions. GACE also reviewed the structural design of the monument and determined that its concrete structure would support the weight of the motorized equipment that was used to first remove the soil and stone elements and then reinstall the landscaping. One of the solutions employed to waterproof the monument was encapsulating its entire cantilevered concrete slab in the Kemper waterproofing membrane. The architects found a mineral surfacing system that matched the finish of the concrete slab and incorporated it into the membrane, hiding the waterproofing and maintaining visual consistency with the original slab. 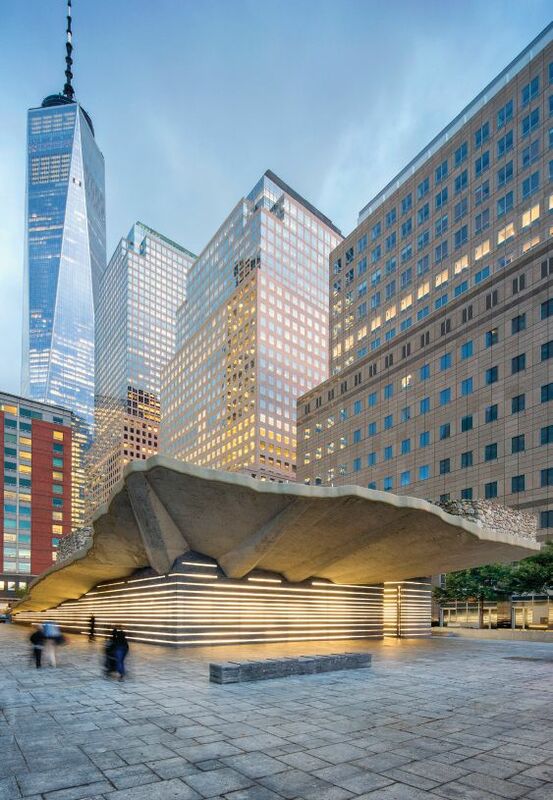 “At the start of the renovation, the project team performed a photographic survey of every inch of every element of the memorial,” notes Frank S. Franco, AIA, LiRo vice president and senior project manager. All elements, including every single stone, were numbered and then removed, cataloged and stored in containers onsite during the renovation, ensuring that the team put each piece back in its correct place and position. 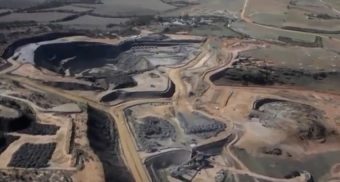 Similarly, the team stripped the soil from the site and saved it for reuse. Prior to work commencement, to ensure the safety of passersby, construction crews built a protective fence around the perimeter of the memorial, as it’s in a busy section of Battery Park City. As the main waterproofing measure, CTA specified installing approximately 2,000 square feet of a reinforced, cold-applied, liquid Kemper 2K PUR system over all exposed core walls and substrates. At the top of the monument, CTA incorporated a custom masonry anchoring system for the fieldstone-and-rubble wall, which is installed over a sturdy concrete masonry unit (CMU) core faced with fieldstone and mortar. The new masonry anchor system was installed to keep in place the irregularly shaped stones within the fieldstone wall. According to Pericle Gheorghias, CTA’s senior technical designer on the project, one of the new solutions employed was encapsulating the edges of the slab in the Kemper waterproofing membrane. The team also conducted some minor masonry restoration on the cottage. This work, however, isn’t visible to visitors, nor is most of the waterproofing and restorative work. The crews also installed new, aesthetically sensitive exposed aggregate concrete paving of the cottage and pathways, including new concealed access hatches to the interstitial service area. 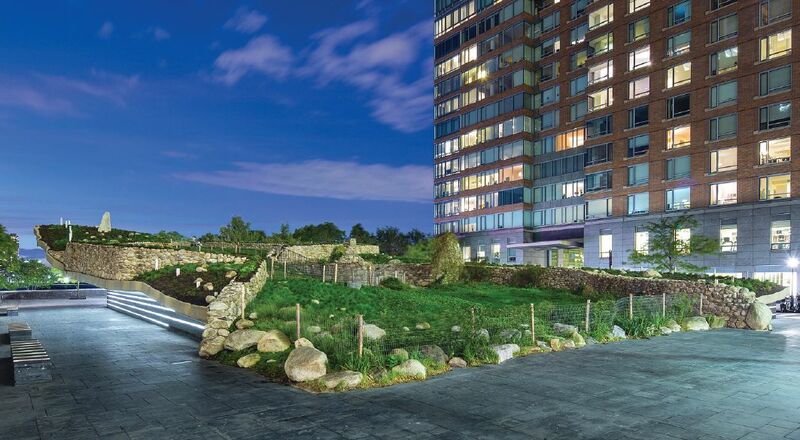 The project’s main challenge was making the meadow function as a live elevated field with naturally growing plants and its own living ecosystem, despite the planted area being located on top of a waterproof concrete slab. The square footage of the planted area is approximately 7,200 square feet. The original planting consisted of 90,000 plugs of native grasses and 52 different types of plants. CTA closely collaborated with SiteWorks, which performed an analysis and documentation of the existing plant material to be contract grown. It also conducted a detailed topographic survey to document the furrows, which are integral to the design intent. The inventory and subsequent restoration of the furrows proved challenging. 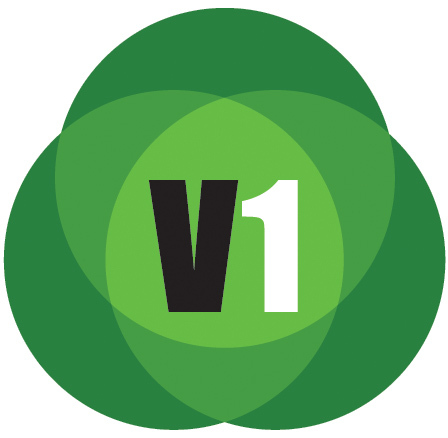 SiteWorks’ existing conditions survey included points taken every 3 feet. This painstakingly produced document was instrumental in providing a base for the soil profiles and irrigation layout. Specifically, the team noted that the soils system was comprised of three zones that mimicked natural soil profiles: a sand drainage layer, a combination of existing drainage layer soil and sub-base soil, and a new engineered topsoil layer. “To ensure that the existing soils could be reused, they were trucked offsite and maintained with a specific windrow length and height,” explains Paul Ersboll, RLA, LiRo senior design manager. These soils had actually become homogenous over time, so the team separated out a portion and added organic material to make up the top layer. The contract-grown plants—all indigenous to Ireland—were grown offsite and then replanted following the completion of the renovation, after weather conditions and the plants allowed. 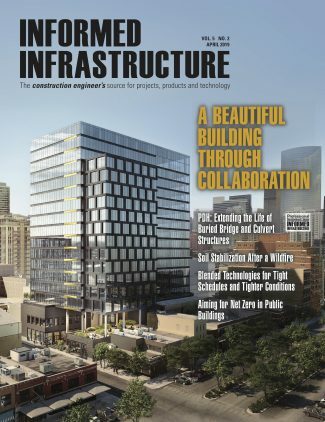 “We recommended that the plants begin growing early in the construction phase, as it would take a minimum of one year for them to grow to the point that they are viable,” explains SiteWorks Senior Project Manager James Dudley, ASLA, ISA Certified Arborist. The vegetation includes four primary categories of plants: herbaceous annuals and perennials (19 different varieties, from 242 quarts of Geranium sanguineum to 522 quarts of Ranunculus acris “Multiplex”); grasses, rushes and sedges (18 types, including 529 plugs of Carex shortiana); dwarf shrubs and woody plants (eight varieties, including 1,216 quarts of Calluna vulgaris “Kinlochruel”); and vines (six Clematis vitalba at the cottage).